When Instagram first introduced Stories, the conversation was all about the comparison to Snapchat. Today it is a tool used by businesses, influencers and brands to reach and engage with their audience. But according to a new study from Fanpage Karma, small Instagram profiles are less likely to use Stories. The report is particularly relevant to small businesses because it also looks at Instagram pages with up to 10,000 followers. As more small businesses increase their social media presence across different platforms, having a performance guideline is a valuable insight. The data for the report is based on the analysis of 2.5 million stories from 500,000 Instagram profiles in February 2019. The profiles were divided into five size categories for analysis with the goal of determining the average values for the most important key figures. Instagram profiles with many followers are posting 3 Stories per day on average. And when they do post, they are using videos to do it. Small profiles on the other hand rather use pictures to communicate with their audience. But more post doesn’t translate to more reach. 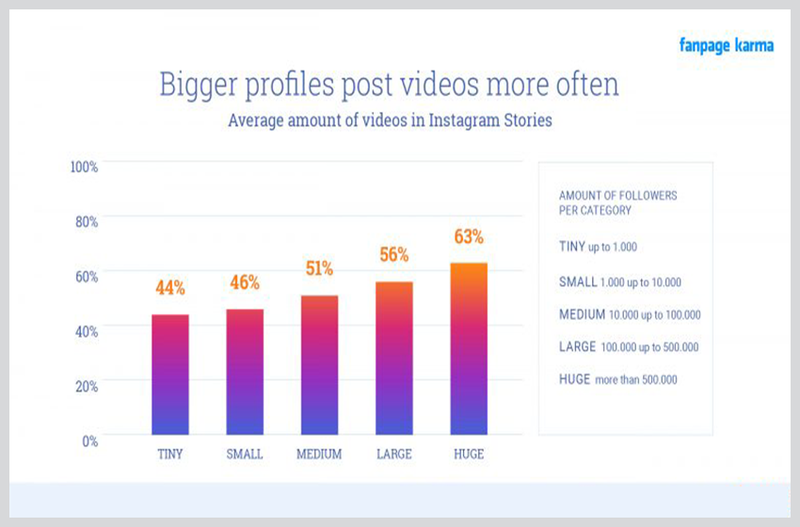 Small Instagram profiles reach a higher proportion of their fans than larger profiles with Stories. This reach extends to people more than it does to brands as people reach 50% more followers than brands. With an average posting of 1.04 per day, small profiles have to make each post count, and the data proves they do. The numbers are even better for tiny profiles posting less than one Stories per day. For tiny profiles the impressions, reach, and replies per impression are higher than all the other groups in the report. In terms of categories, Instagram is not the platform for political views. The report says Instagram is the place for fashion, travel, food and fitness. The reach and impressions on Stories are a mixed bag of data. 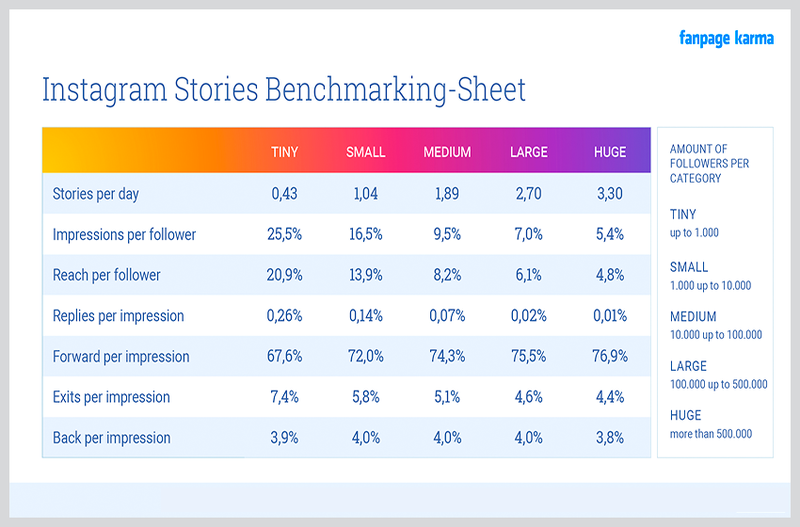 While posts can reach up to 60% of followers, Stories doesn’t have the same reach values. Only 5% of large and 20% for small profiles make their reach. The benefit of using Stories is it enables a different type of communication and interaction. This is especially true of large profiles of real people instead of brands. Large people profiles or influencers as they are now called achieve more reach than brands. This has increased the influencer marketing to a multi-billion-dollar industry. The study also says don’t expect replies from Stories. Even for small profiles, fewer than 1,000 followers respond, with large profile receiving a reply is similarly low at dismal 0.01% rate. The reply number is low across the board for all profile sizes. Fanpage Karma recommends people and businesses use stories more often. The company says posting three stories per day is not annoying and it doesn’t reduce reach. Additional recommendations include using more videos and not being discouraged or irritated by less reach or fewer replies.